June Tailor Ruler Shape Cut Plus Quiltools 12 in. x 18 in. Description: June Tailor Rulers are designed to help make quilting and sewing projects easier and more efficient. Creating fashions are quick, easy and lots of fun with each wonderful ruler. Use your rotary cutter and mat, and you'll be creating beautiful quilts, hats, scarves, tabletoppers and more. 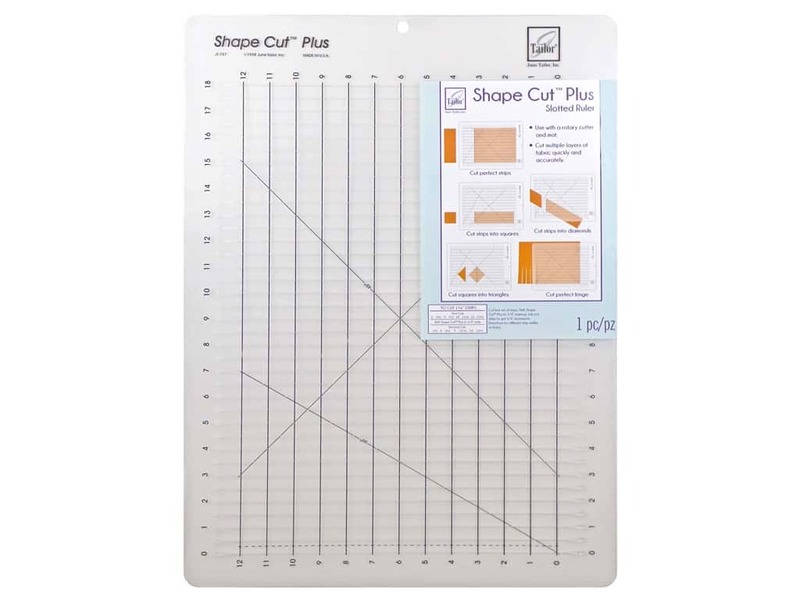 Shape Cut Plus Quiltools 12 in. x 18 in. - Plus, there is a .25 in. line that will let you cut in .25 in. as well as .5 in. increments. Just cut strips, then turn for complete squares, triangles, diamonds, chevrons and hexagons. You can even cut several layers of fabric at one time! The slots will hold your cutter in place, so it can't shift. See more June Tailor Rulers. June Tailor Ruler Shape Cut Plus Quiltools 12x18 -- CreateForLess 0.00 out of 5 based on 0 ratings. 0 user reviews.